2. Combine filling ingredients in a large mixing bowl and completely mix together. Set aside. 3. To assemble: Roll 1 chilled dough out onto a lightly floured surface into a 13” x 9” rectangle and brush surface with egg wash.
4. Scoop filling into a piping bag or resealable plastic bag and cut a 1/2 inch opening at the tip. 5. Leaving a 1/2 inch border around the edge and beginning on the left (13 inch) edge, pipe 8 lines of filling, 2 inches apart. 6. Roll other disc of dough to a 13”x 9” rectangle. Sprinkle sesame seeds over dough and using a rolling pin, gently embed sesame seeds into dough. 7. Carefully lift and place sesame studded dough over filling topped dough and gently press down between filling and edge to seal. 8. Slice to separate each hand pie stick and using the back of a fork, crimp edge of each stick. 9. Transfer sticks to a parchment lined baking sheet, about 1 inch apart. 10. Brush each stick with remaining egg wash and sprinkle with sea salt and cracked black pepper. 9. 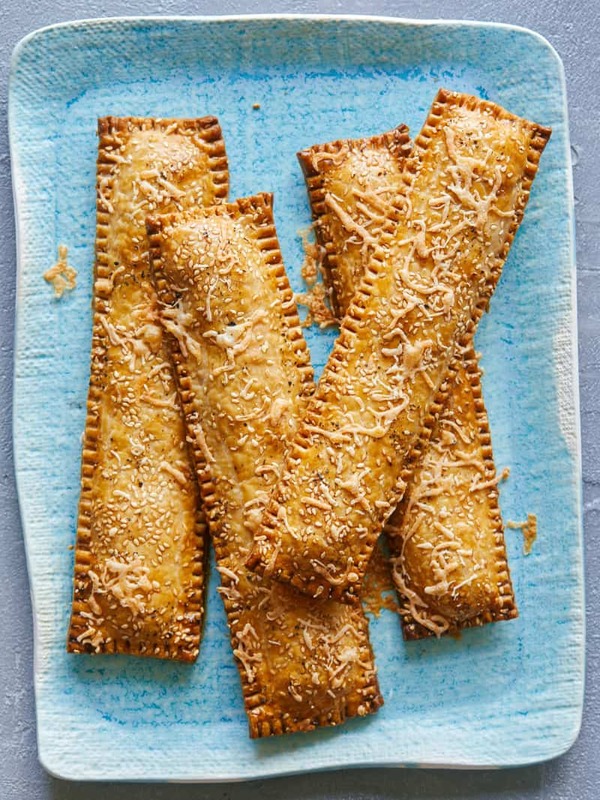 Bake hand pie sticks in the oven for 20 to 25 minutes or golden brown and cooked through. 10. 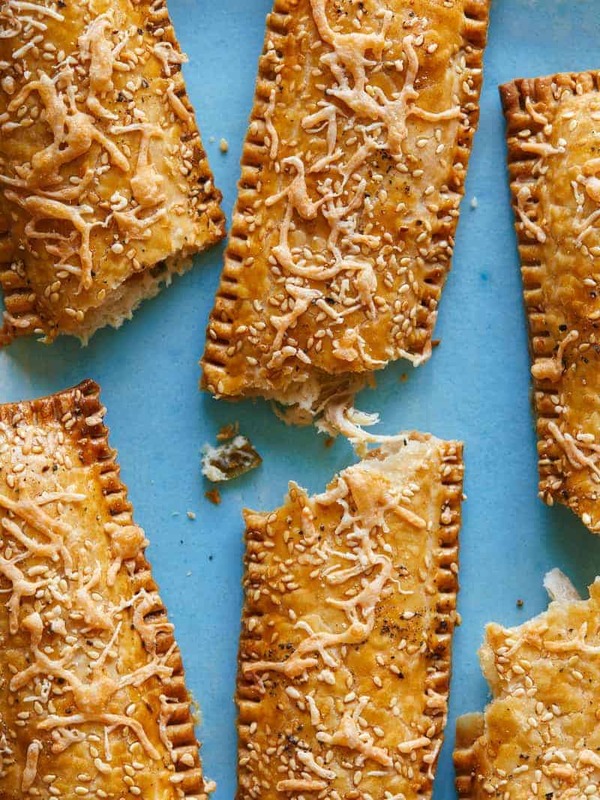 Allow savory hand pie sticks to cool, about 15 minutes, before serving. This makes me think of a delicious and portable chicken pot pie. Which, for the record, I am 100% on board with! These sound so good! And the ingredients are totally simple too. Definitely on the list for dinner this weekend! Do you think these would freeze well? I’d like to make a bunch and freeze them, and then bake them when needed. Will it work? Thank you! For the crust, do you use the panko bread crumbs?? Ah no, it’s actually shredded white cheddar sprinkled on top! Totally forgot to add that into the recipe! Will update soon! Sweet Heavens ! This is beautiful ! Can you use pre-made crust? OMG–these are SO good! Of course, I can never leave a good thing on its own, so sauteed about 1/4 c diced onion and 1/2 c diced mushrooms to add to the cheese filling–both veggies losing a lot of volume on the way. How much chicken did you actually use–in my local supermarket, a boneless, skinless chicken breast varies between about 14-20 oz, so I used less than one, about 3/4 lb and it was still a tight fit for the pies–I had to roll the pastry really thin, 15×9, and got another pie out of it. The only place I actually see 4 oz chicken breasts these days are on those Omaha Steaks commercials. I might try these again with onion and green chilies–or Kalamata olives and a bit of sundried tomato. I think there are lots of potential combos. Thanks for a real family pleaser!